Cape Town International Airport is serviced by all the major car rental agencies in South Africa - Avis, Hertz, Thrift, First Car, Europcar, Bidvest, Budget & Tempest; as well as a couple of smaller ones - Capital Car Hire and Around About Cars. They're all reputable agencies offering relatively new vehicles, so we recommend going with the cheapest (a Kia Picanto is the same, no matter which agency you hire from), taking free km and how far you plan to drive, into account. Our petrol-heads would love to help you! Most people hire a rental car from Cape Town International Airport (it's usually cheapest from the airport as opposed to the city), but the bigger agencies have offices throughout greater Cape Town. To hire the cheapest vehicle from Cape Town International Airport, just use our handy car rental comparison tool on the right. *Note that prices may have changed since we did these quotes. 2018-06-11 How much will I have to pay for a C-Class Mercedes with automatic transmission, from the 15 - 18 June from Cape Town Airport? That vehicle from Cape Town Airport for 3 days will cost R 3 513 *. 2018-06-11: Hello, I would like to rent the cheapest vehicle available from the 20 - 26 June 2018. For the 6 days a Chevrolet Spark from Cape Town Airport or similar will cost R 1 126 *. Hiring a car directly after you land is the easiest way to cruise around The Mother City, especially for families with children. By renting a pair of wheels you can ensure that you get to see all of her major attractions at your leisure. It also means that you can afford to be more relaxed about your holiday planning. You can use the offerings from the car rental agency of your choice for the entirety of your stay and you are also given the option of picking up your chosen vehicle at the airport and dropping it off at a corresponding outlet in the Cape Town CBD. Instead of hiring directly from the airport, one can also collect a hired car from numerous rental depots in Cape Town. The one-way car rental option allows customers to pick up a car from CPT International and drop it off in another part of the country (e.g. Johannesburg, Durban, PE) - the perfect opportunity for a roadtrip! As lovely as Cape Town is, crime does happen and it’s better to be safe as sorry. Opt for a sedan, SUV or Minibus over a hatchback as it is a much-loved trick of local criminals to smash in the glass of the back window of a hatchback and steal the goodies stored there. Another useful tip is not to leave handbags, luggage or valuables on the passenger seat or in clear view when you are parked in a public area, criminals will not hesitate to shatter the window and grab the items of value. Why book a car with us? Well, we can offer you the best deal that’s why! Ask for a quote with your location and dates in the comments section below or fill in a car rental reservation form. Our car rental enthusiasts are always willing to assist! Unit 5, 33 Concorde Crescent, Concorde Park, Airport city. Unlike Durban and Johannesburg, if you're heading from the airport to the city you wont encounter toll gates in Cape Town. The closes toll gates is if you switch to the N1 and drive towards Worcester along the N1 national road through Du Toits Kloof tunnel - if so keep some cash handy. Automatic vehicles for hire include the Hyundai i10 Automatic, Nissan Tiida Automatic, Chevrolet Aveo Automatic, Toyota Avensis Automatic, BMW 3 Series Auto, Mercedes C Class Auto, Mercedes E Class Auto, Kia Sportage Automatic or the Toyota Fortuner Automatic. Whilst hiring a car is not the cheapest option for getting around town, it IS the most convenient. Other options one could explore are travel by taxi (taxi’s must be hired by phone or taxi rank – they are not flagged down off the street like you see in the movies!). Taxi’s are known for charging a lot and there is the inevitable matter of waiting for it to arrive and booking another one for when you want to be collected – this puts time limits on your fun which is not ideal. Rikki’s Taxi is one of the higher quality and cheaper options, that is, if you select the share option (which must be asked for beforehand). This alternative allows you to get to your destination with multiple stops along the way as others share your cab... it might take a while. Minibus taxis on the other hand can be yelled for from the pavement, however, this is not the safest option and often times you will end up squished in the back with a whole bunch of strangers. The downsides are the wild driving and overcrowded vehicles but the upside is that is it a very cost effective way to get from A to B. The inner metropolis of the city offers the MyCiti Bus Service. This service travels within one of 2 detached routes that both start at the Civic Centre Station. This is a much safer way to travel and highlights some of the city’s major sights. That being said it will not guarantee that you get around to everything on your ‘to-do’ list. If you like to travel by train then this is also an option. Whilst safe during the day, trains should be avoided at night. The Metrorail Station is located on Adderly Street in the heart of the city. The train goes to just about anywhere including Paarl, Wellington and Malmesbury . If you are in need of travel after dark then a rental car will be much safer. Table Mountain Cable car – Take a ride up to the top of one of the 7th wonders of the world and experience the sheer beauty of the city view. You can have breakfast, lunch and snacks at the Table Mountain Cafe or, if you’re feeling adventurous, you can abseil your way down! Cape Town Carnival – Happening 15th March 2014, this sensational festivity celebrates Africa at its best, acknowledging the diverse nature of its cultures. The Festival erupts onto the Green Point walk-way (originally build to accommodate the thousands of fans during the FIFA world cup held at Cape Town Stadium in 2010). Celebrations will start at 3pm – food and drink will be plentiful. For those (over 18’s) who can’t say no to a good time, there will be a carnival after-party with VIP DJ appearances such as DJ Fresh and the superb local band, MiCasa. Boulders Beach – Between Fish Hoek and Cape Point is the famous penguin colony that resides on Boulders beach. This is a firm favourite for the kids and a fun outing for the whole family. It is a great swimming spot (away from the birds of course) and the penguins can be viewed from a wheel-chair friendly boardwalk. A small entrance fee is charged that goes towards ensuring that these feathery swimmers, as well as other creatures in this conservation area, are kept safe. Lion’s Head – Anyone up for a hike? One of the most spectacular paths to trundle in the Western Cape, the Lion’s head hike takes you to the pinnacle of the Lion’s Head peak. Offering panoramic views of the City, the Atlantic coast as well as Table Bay. The 60 minute hike is seriously worth it! Golfer’s Paradise – The Cape is riddled with beautiful, luscious golf courses. Rated exceedingly well in terms of location and design, the various greens of the Cape are guaranteed to provide an enjoyable game, no matter your handicap! A few that are worth mentioning include Steenberg Golf Estate, Westlake Golf Course, King David Golf Club and Rondebosch Gold Course. Artscape Theatre – Are you a lover of the finer things in life? Enjoy anything and everything including Opera, musicals, interpretative dance, orchestral music and ballet. Gourmet Restaurants – The Western Cape is known for its wine routes and unbeatable restaurants but, for the sake of avoiding drinking and driving, we will concentrate on the food! Delaire Graaf Estate, Tokara Estate, Aubergine (Gardens), Five Flies (CBD) and La Moutte (Sea Point) are a few of the finest restaurants that CPT has to offer. Kirstenbosch – For those who would rather kick-back and relax, why not check out Kirstenbosch botanical Gardens? Located in the southern suburbs of Cape Town, the flourishing garden is too beautiful for words. The best time to visit is in spring when the flowers come out (mid September) or on a Sunday during summer (Early December to mid-March) when you can have a picnic whilst enjoying one of the weekly sunset concerts, what a treat! Tickets need to be booked in advance. Online System down when we checked. The offices for all car hire companies are located right next to each other adjacent to the airport terminal building and each car hire company’s office is distinctly marked in their respective colours and logos. Because there is a road between their offices and the terminal building there is an underpass which clients must take to get to their offices. 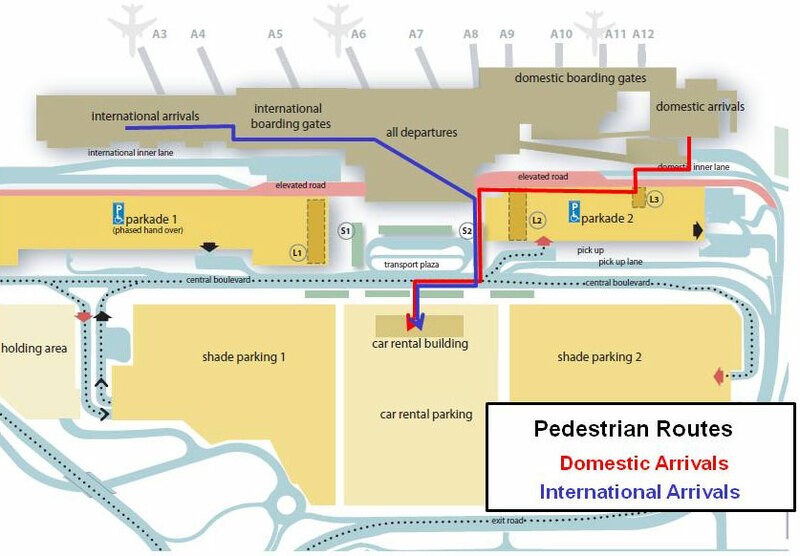 If you exit the airport building from the domestic terminal, they are located just across the road on your right (you then use the underpass bridge to get to their offices).